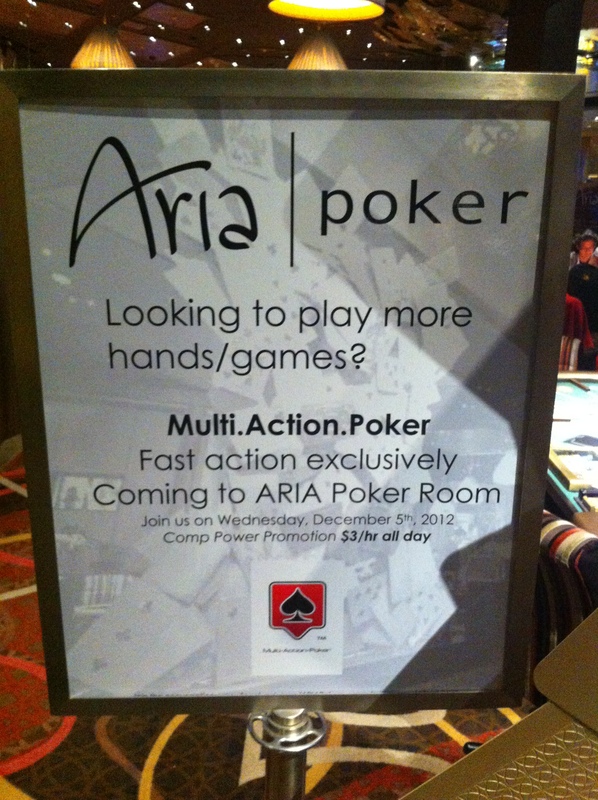 Ever on the lookout for more innovation and a differentiation among all the poker rooms in Vegas, Aria introduced Muli-Action Poker. The idea is that you have 2 dealers and are dealt two hands at the same time. Each seat has 2 areas to put chips. Your chips must be segregated and can not be moved between the two games. 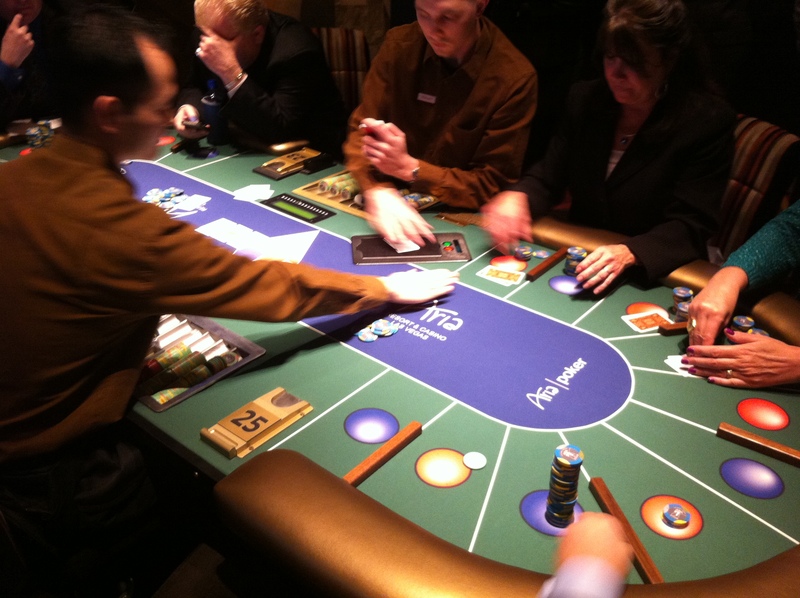 Dealers sit on opposite sides of the table in the middle. and deal the board to the right of the table centerline. 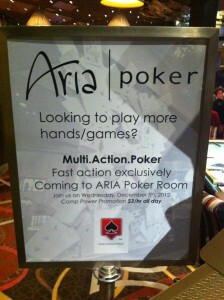 I guess it is meant to simulate the multi table/hand experience you have online. I happen to be there the first day when the staff was doing a dry run with mock players and chips. To get around telling which chips belong to which game, two different limits are spread (3/6 and 5/10 in the dry run above). I am thinking this would not be good for No Limit because your attention would be spread too thin and managing the chips would be a nightmare for the dealers. I am thinking it would be good to have hold em and Omaha together to further differentiate the players cards/holdings, but the audience that that is really limited. Playing Stud or mixed games would be even harder,. Isn’t the whole point of live poker is to stare your opponent down and to get reads/live tells? 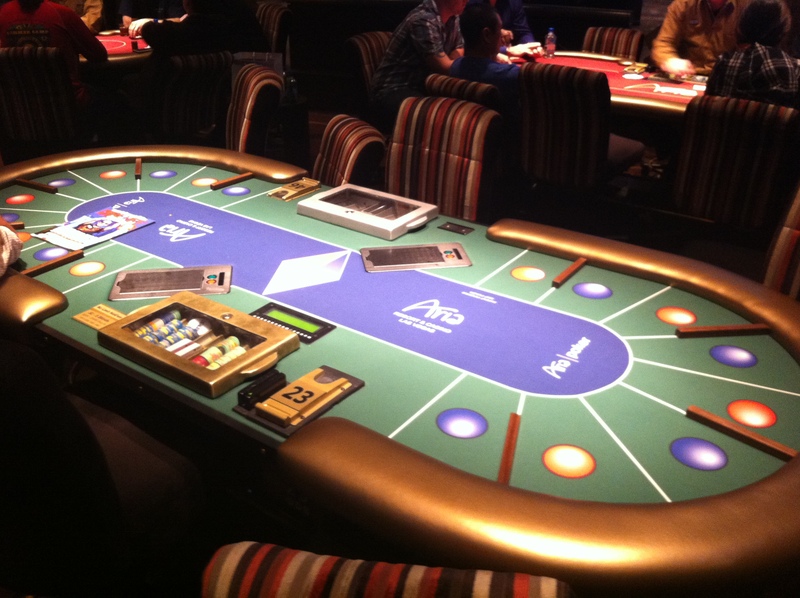 With so much activity at this table, you might as well stay home and play online. When I went back later that night, the table was bare, no players. Talking with a couple of the dealers who did not think it was a good idea. It slows the game down, and the house can probably make a better rake with 2 single tables. Will be an interesting experiment for sure. Will see if it catches on anywhere.